Ethiopians and friends of Ethiopia came out in large number to protest against Meles Zenawi, the dictatorial leader of Ethiopia, who came to London on March 31st 2010 to co-chair the new High-level Advisory Group on Climate Change Financing as he has been selected to the position by the miss informed Secretary-General of the United Nations Ban Ki-moon. 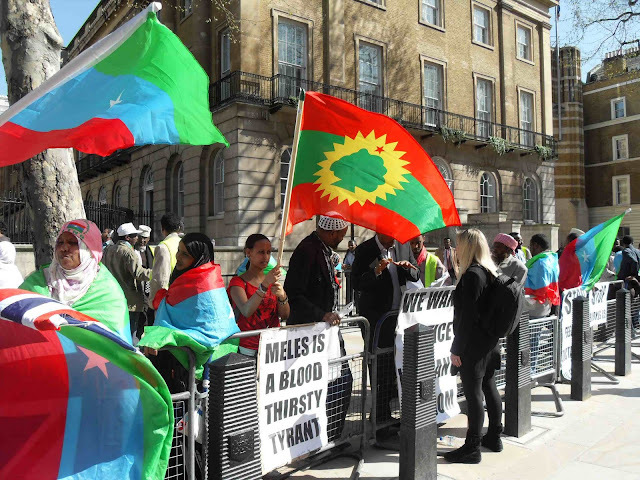 Despite the cold and chilly weather the protesters descended to Downing Street from different parts of the United Kingdom and spent more than 7 hours chanting slogans and distributing leaflets to passer-bys that reveal the barbaric acts of the Ethiopian tyrant and his government. The demonstrators demanded the British government not to support the tyrannical regime of Ethiopia as the latter uses the British taxpayers’ money to suppress dissents. The protesters questioned the quite diplomacy British has been following towards Ethiopia and mentioned about the newly released human rights report of the foreign and common wealth office of the United kingdom which didn’t dare to mention the human rights abuses in Ethiopia. When the Ethiopian tyrant arrived at the gate of the Downing Street, he couldn’t have the courage to see the protesters. The organisers then delivered petition to the office of the United Kingdom’s prime minister and continued their protest until the Ethiopian dictator left the place. Despite the fact that the organisers of the demonstration had been allowed to stage the protest up to 4pm, the protesters waited until the Ethiopian despot came out and showed him what he deserved.